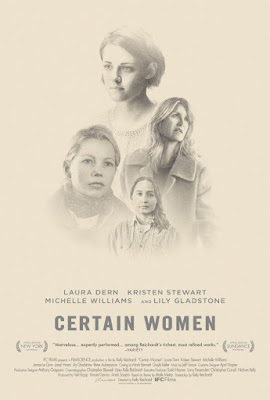 Certain Women is my introduction to the much celebrated writer/director Kelly Reichardt who has crafted such films as Wendy and Lucy and Night Moves. Reichardt is said to craft these methodically paced character studies that exist more for their introspective takes on the lives of their characters than anything resembling plot. Minimalist, if you will. Reichardt seemingly adapts many of her films from short stories or collections of short stories. And while I've yet to see any previous films from the filmmaker including her much heralded 2010 feature Meek's Cutoff I don't know that her latest necessarily urges me to go back and see what all the fuss is about. That said, Certain Women is certainly intriguing though the reasons for such interest fall more on the befuddling side of things rather than the promising. It is easy to sell the minimal approach as being more insightful and more telling simply out of the convenience of letting the audience do more of the heavy lifting, but some of the time keeping in line with the minimal approach is simply a substitute for there not being much to say in the first place. It's not hard to appreciate that Reichardt has approached these tales of three individual women in three different stages of their lives that only overlap in the most subtle of ways in an even more subtler fashion, but it is only by virtue of the focus shifting from one story to the next that the film doesn't become a complete and utter bore. And it would were it left in the hands of certain characters and beside the fact this is the point of those certain characters' profiles-documenting the monotony and lack of anything spectacular or interesting occurring in their lives-the film isn't ever able to come up with anything new or profound enough to say about the mundanity of daily life or the foibles that eventually bring us all around to the same level playing field as human beings to be noteworthy in its own right. I can understand and again even appreciate that this is very much a film that speaks to the complex and misunderstood experiences of the female in our male-driven society, but as a product that is intended to convince me of the discrepancies and double standards females deal with on a daily basis that males might not even consider I took away very little by way of enlightenment. There is a fine line between being understated and simply being uninteresting and unfortunately Certain Women skirts that line too often to fall on that minimal, but effective side of things. Gina Lewis (Michelle Williams) finds it difficult to deal with her family dynamic in Certain Women. 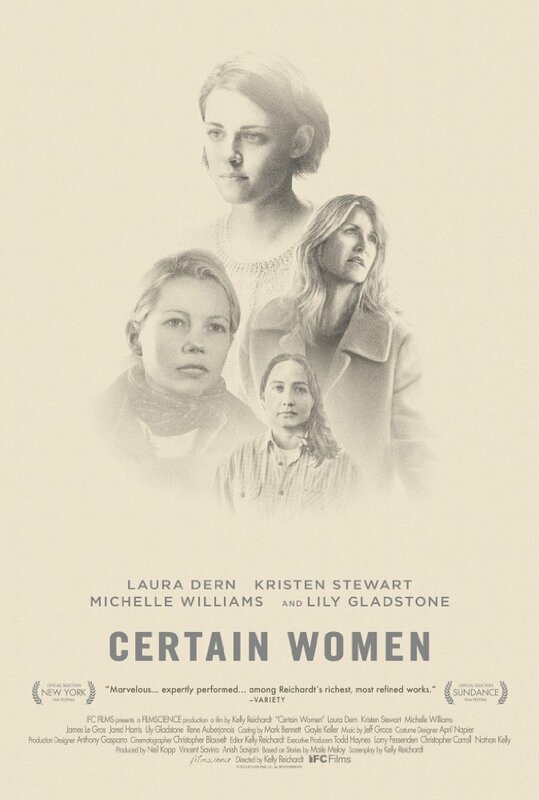 Set up in a triptych fashion where each of the three pieces follow one another without so much as a fade out to fade in, Certain Women first introduces us to Laura Wells (Laura Dern) who is a small town lawyer in small town Montana that, when we first see her, is in bed with a man who is clearly not her husband. They are shacked up together in a less than elegant hotel room, listening to talk radio, and the incessant sound of trains in the background. The setting is ripe to display where all manner of seeming hope or surprise goes to die. This is the epitome of dragging your existence from one day to the next as even Laura's partner in this scene (James Le Gros) seems disinterested in their relationship as he hurries to get dressed and is off without even saying goodbye. All of this is to inform us of the tapestry of Wells' life and what her actual existence means to her given it is filled with late-night TV and bags of potato chips with most of her days spent dealing with the likes of frustrating clients like Mr. Fuller (Jared Harris) who don't believe Wells has done everything in her power to help their case simply because it didn't turn out the way they'd hoped. Fuller is a man who has been beaten down by life-injured in a work-related accident, but who took the first settlement amount from his employer (which wasn't enough to cover a month's worth of mortgage) rendering any further lawsuits void. Wells and Fuller have little to no relationship, but Fuller can't seem to stay away out of nothing more than desperation while Wells is left to deal with a situation that might be more easily accepted were she a man. It is in the crux of such circumstances that Dern as Wells voices the apparent theme of Reichardt's film saying, "It'd be so lovely to think that if I were a man I could explain the law and people would listen and say, "okay." It would be so restful." And so, less than ten minutes into the film Reichardt has established the ideas she intends to explore by simply presenting these three individual scenarios. As the filmmaker is accustomed to, things are kept to a minimum as the film develops and deepens the relationship between Fuller and Wells. It is through something of a ridiculous situation that we see these characters form something of a symbiotic relationship. Both are portrayed as rather pathetic and the plight that brings an unusual mark of excitement to their lives bonds them in a way that they will continue to turn to one another for such feelings. It's weird, but given the resolution offered and the slight performances from both Dern and Harris-it works. Moving on, we next meet Gina Lewis (Reichardt staple Michelle Williams) as she walks through a wooded area that has been set upon by the winds of winter. She is bundled up and only accompanied by the sounds of flowing water. She seems at peace, but it's that kind of peace the person experiencing it knows will only last for so long. This end to Gina's peacefulness comes as she slowly marches towards a tent that houses her daughter (Sara Rodier) and her husband, Ryan (Le Gros). Lewis immediately strikes us by being concerned rather than equally joyful when her daughter emerges from the tent laughing. When Lewis asks, "What's so funny?" Her daughter, Guthrie, dismisses it and continues to carry her bags to the family vehicle. Upon entering the tent she asks Ryan the same question as if nervous whatever the pair might have been joking about had something to do with her. Gina is clearly a prickly woman who likes things to be done a certain way-likely on her terms the majority of the time-and yet it is clear this attitude conflicts with Ryan's more free-wheeling approach and their teenage daughter's natural tendencies to rebel. Gina is having a tough time acclimating to the current climate of her family, but this is not without effort as she seems to want to fit into this ever-changing puzzle that is human relationships with her authoritarian position not allowing her to give into such carelessness. It's clear that if Gina were to give a little in the way of matching Ryan or Guthrie in the middle with their differing perspectives things could go a long way, but that isn't going to happen and given we're already privy to how Ryan is dealing with the strain of his and Gina's marriage it's hard to feel hopeful things will resolve themselves for the better. This middle segment of the film is easily the weakest link of the three as it offers little more than Williams' performance to hold our intrigue. Unlike the previous and forthcoming scenarios in which we're unsure how the two principle characters might feed into and off of each other's lives this middle section only serves to paint a picture of a fractured marriage and the thankless role a wife can serve that is looking to be bandaged by the building of a new home. This brings forth the centerpiece of the segment in that Gina and Ryan are hoping to convince an elderly man, Albert (Rene Auberjonois), to let them use sandstone that was used in the original school house in the construction of their new house. This interaction offers a glimpse at what Gina is capable of in terms of humanity, but though the undercurrent of her conflicted emotions is strong throughout mostly thanks to Williams' performance, the chapter as a whole plods along with too limited an intent to truly be effective. 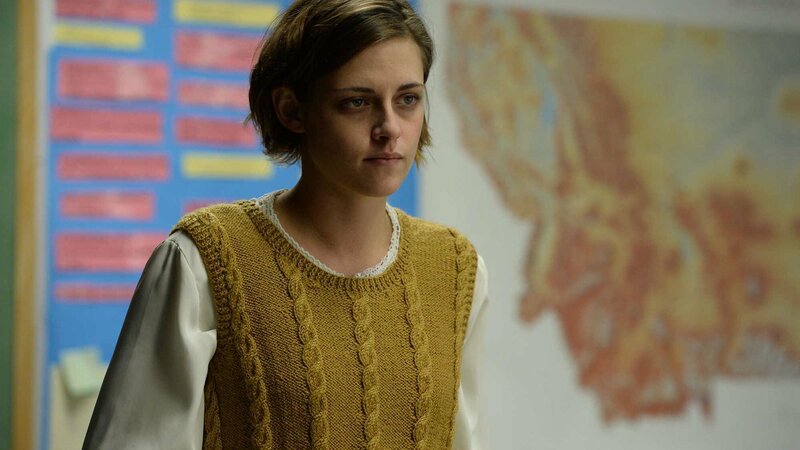 Beth Travis (Kristen Stewart) is teaching a night class four hours away from home due to one of her many insecurities. And so, without so much as a wave we are moved along to the third and final act of the film that presents the monotonous life of one, Jamie (Lily Gladstone). Jamie is a farmer working on a ranch during Montana's cold winter-going through the motions of keeping the horses fed and well taken care of during the day while doing little more than laying in her bed and watching old sci-fi shows at night. Either that or staring up at her unfinished bedroom ceiling and contemplating what could be any number of topics. It is this monotonous and solitary existence that prompts Jamie to drive into town one night and randomly select an activity to bring her out of this well-established routine she has realized is producing little satisfaction. Seeing a handful of cars parking and people walking into the town school building Jamie stops to see what function might be taking place only to discover it is a night school class for teachers centered on school law. This isn't what entices Jamie to stick around though, what does this is the presence of the young teacher, Beth Travis (Kristen Stewart), who it turns out is fresh out of law school and, despite having recently secured a position at a firm, took the teaching job out of fear of never getting a real job despite the commute to Jamie's small town being four hours. A friendship between Jamie and Beth quickly forms as the two begin a routine of eating at the local diner after Beth's class every Tuesday and Thursday, but while Jamie is clearly infatuated with the meek yet self-involved Beth, Beth sees nothing in Jamie other than someone who she can spout off her fears and concerns to rather than another living entity she might garner some perspective from. There isn't anything necessarily wrong with Beth in terms of her attitude and she is certainly kind and thankful at all the appropriate times, but she simply can't see past her own life and her own problems. Stewart handles this expertly. It is in this segment that Reichardt's minimalist approach is most successful and thus the most powerful. As Jamie, Gladstone is something of a wonder-handling each awkward situation she finds herself in with a humble and delicate touch to the point we understand why it is so easy for Beth to open up to her despite her sheltered facade. As the relationship develops between these two very opposite ends of the spectrum we are delivered mountains upon mountains of hopes and ideas of what this connection might develop into, but that it lacks any kind of clarification on what it is or will become leaves our hearts breaking for Jamie and aching for Beth. With Certain Women, Reichardt seems to have stuck with what she knows best and though there is clear prowess in the visual and emotional beats tapped into here while admittedly being moved by other portions it simply never resonated on the level it seemed to want to or left the type of impact it seemed destined to.